The J&A Construction Engineering and Inspection Department has the experience and ability to handle your needs during all phases of construction. Quality Construction can be the most cost efficient way to meet project deadlines and avoid construction disputes and delays. Many funding mechanisms, such as federal or state, grants and/ or loans, require strict adherence to relevant construction policies and procedures. 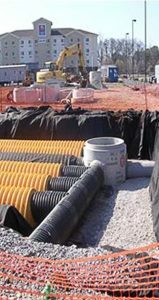 J&A provides services to address these requirements, ranging from periodic observations to resident inspections to the complete management of any roadway, bridge, drainage, sanitary sewer project, or public infrastructure project. J&A is an “on-call” contractor with The Alabama Department of Transportation to provide professional services state-wide in the area of Construction, Engineering, and Inspection. The J&A team has a thorough understanding of applicable federal, state and local specifications, codes, and procedures, as well as the appropriate licensures, certifications, and training.